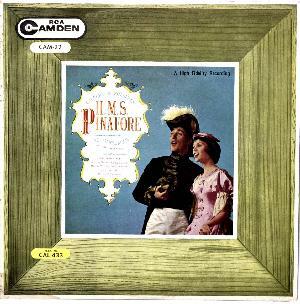 In 1950, RCA released abridged recordings of The Mikado and H.M.S. 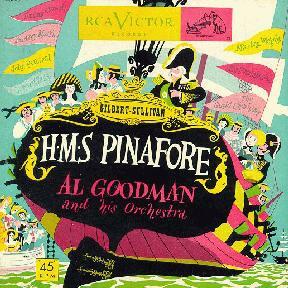 Pinafore featuring Al Goodman and His Orchestra. The soloists were listed on the album cover but were not identified with specific roles; the assignments given above represent a best guess based on the artists listed on each disc of the original set. The recording was originally issued on 78rpm, 45rpm and LP records. By 1953, the 78's and 45's had been deleted, but there was a new issue on "extended play" 45's that omitted three numbers: "Sorry her lot," "Over the bright blue sea," and "Sir Joseph's barge is seen." See the discussion of The Mikado for more on the issue history of these sets. This recording seems to have been done on a small budget, with a small chorus and orchestra (which includes a harp). The soloists are fair. This is a recording for someone who wants all the G&S recordings, but that's about it. RCA Camden CAM-22. The sleeve has the number "CAM-22" at the top, but it states "USA No. CAL-433" at the bottom. Mitchell Orman's comments are on target. Al Goodman was an RCA Victor house conductor, contributing a number of albums to their post-World War II catalogue in the jazz and light opera categories. The Pinafore selections are competently performed, but the artists are, for the most part, not comfortable with (or ignorant of) the appropriate performance style. They were, probably, more at home in the American pop idiom than in G&S. Thus the decided American accents bother me more than they might otherwise. Joel Grey performed Jack Point (in the Walker Yeomen video) with his native American accent, and this also bothers some people. But Mr. Grey had a sense of commitment and a concept which lent his work dignity lacking in the Goodman Pinafore. One may, as some do, disagree with Grey's approach, but there is no denying his artistic stature, or his integrity. The overall mediocrity of this production is typified in the banality of the orchestrations, which are more or less based on Sullivan's originals. The least objectionable passages are re-orchestrations which, while competently written, are never superior to Sullivan's. When they diverge, the results are invariably inferior, such as when bass lines are changed, and fussy decorations incorporated (which add nothing substantial except the bad taste of the orchestrator). There are also chops, cut-and-paste passages, and newly composed transitions which also reflect the orchestrator/arranger more closely than Sullivan. The most egregious orchestrational sin committed is the unnecessary and hideous use of harp effects, which mar the score even more seriously than those employed in the infamous Stratford (Ontario) reworkings of the 1980's. The opening of "Over the bright blue sea" is incredible in its clash of styles: it begins with lush harp effects more appropriate to the score of South Pacific than H.M.S. 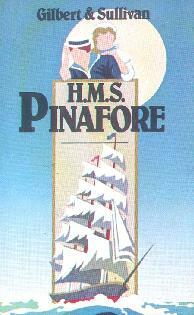 Pinafore, and sounds like the introduction to a Technicolor movie with a tropical locale. The choral writing appears untouched, and the level of instrumental and choral performance is adequate for "house" professional standards. But in addition to the diction drawback mentioned earlier, the chorus needed better coaching than it evidently received. Robert Shaw, who was doing work for RCA Victor in those days, would have been a better choice as musical director for this Pinafore. The soloists are not uniformly adequate. The best of the lot is Audrey Marsh, who has a lovely mezzo soprano voice with some real contralto depth. However, she sings the Buttercup song with the same kind of rubato one might expect if Stephen Sondheim had written the ballad, and she rolls her r's interminably and in inappropriate places. Jimmy Carroll as Ralph is out of his depth vocally; his voice has a less pleasant quality than Leonard Osborne's although he does handle the tessitura a little better. Martha Wright transposes both of her big solos ("Sorry her lot" and the "Simple sailor, lowly born" section of her big Act II solo) down, a half step each time. But she does float a very nice high "A" at the end of the former. Her quality is reminiscent of Victoria Sladen on a good day (see the 1955 Princess Ida for details). Leonard Stokes sings Sir Joseph better than most D'OC patter men did, but gives no special character to the role. I would not recommend seeking this out except for the unintentional hilarity it will give to connoisseurs. CAM 22 Apparently the Australian issue of CAL-433. 9 "Carefully on tip-toe stealing"